You probably read the title of this post and said, “WHHHHHAAATTTT?” because you had no idea that you could sell clothes on Facebook. Yeah, me neither! I just found out a couple months ago and my mind was blown! I first heard about clothing buy/sale groups when reading other reviews of Stitch Fix. There would occasionally be a mention of selling the unwanted 5th item on the Facebook boards to get the discount for buying all the items. My interest was piqued, so I went on Facebook and requested to join a few different Stitch Fix groups. Once I was approved, I started watching how other ladies would sell their items to figure out whether it was worth the time and effort. It seemed easy enough, so I posted two sweaters from my August Fix that I was sure that I didn’t want. I figured, if they sold before I had to check-out than I would keep the rest of the box for myself. If not, no big deal. I was shocked that BOTH sweaters sold within 24 hours and I was immediately hooked. Within the next few weeks I started cleaning out my closet of anything I didn’t totally love and watched my Paypal account grow larger and larger. I then joined a couple non-Stitch Fix groups and continued with my closet purge. 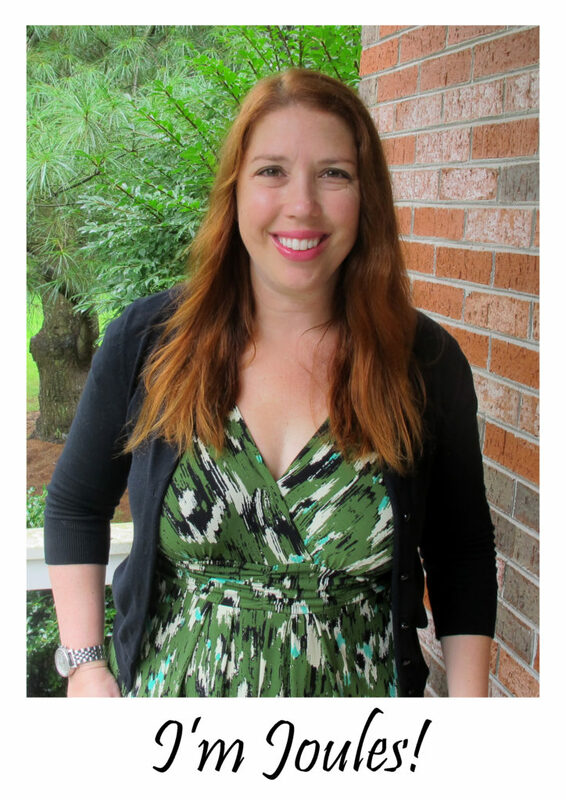 While I’ve mostly been working on cleaning out my closet, I have purchased two items off the boards as well – this elephant blouse and this gorgeous Stitch Fix tank top. All in all, it’s been such a great experience that I wanted to share some tips with you in case you wanted to try it out for yourself! If you don’t already have a Paypal account, click over and sign up for one. From what I’ve seen, every group seems to use Paypal for all of their payments. It only charges a small fee on purchases (which the seller pays) and the buyer automatically gets insurance protection in case the sale goes wrong. When I sell an item, I go over to Paypal and immediately send the buyer an invoice by entering their email address, the amount of the sale, and a description of the item. As soon as they pay, I get an email letting me know the money is in my account. Easy, peasy! I initially joined a bunch of groups, but then pared them down to a manageable amount. There are TONS of groups out there from general Closet Cleanout groups to specific store/brand groups. Use the Facebook search box to find out if there are groups for your favorite brands. Each group is run by its own administrator, which means that they all have their own rules. For example, some groups have specific rules on how you should word your post, how to call ‘dibs’ on an item and how quickly a post should be deleted. Group administrators are sifting through a ton of posts every day (for NO pay), and they don’t tolerate rule-breakers. So, be sure to follow the instructions pinned to the top of the group page or you may find yourself kicked out of the group. When you are approved to join a group, take some time to look around at other posts before starting to do your own. It can give you a good idea on the format that works best for posting, what the typical prices are, and how sellers estimate shipping. When I first joined the Stitch Fix groups, I found that a couple of the super popular items that were being sold for almost full price were living in my closet. I was able to see what the typical sale prices were and decided to go ahead and sell them since I wasn’t reaching for them very often. 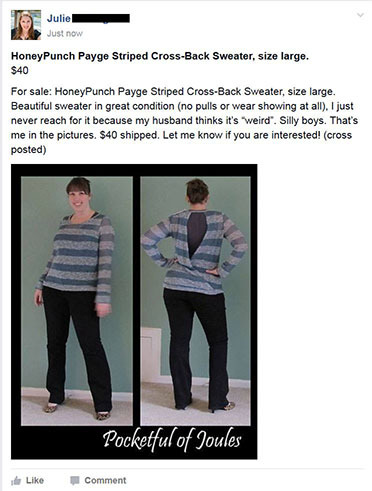 I’ve also found that items sell a lot quicker if you take pictures of them on you, rather than just on a hanger. It helps the buyer see how it fits an actual body so that they can decide if it will be right for them. When you sell your item to someone, make sure to treat it seriously like you were a store doing a transaction. Package your item nicely, mail it first class (or priority mail) so that you get the free insurance and a tracking number, send your buyer the tracking number and just be all-around courteous. So, is your mind totally blown? 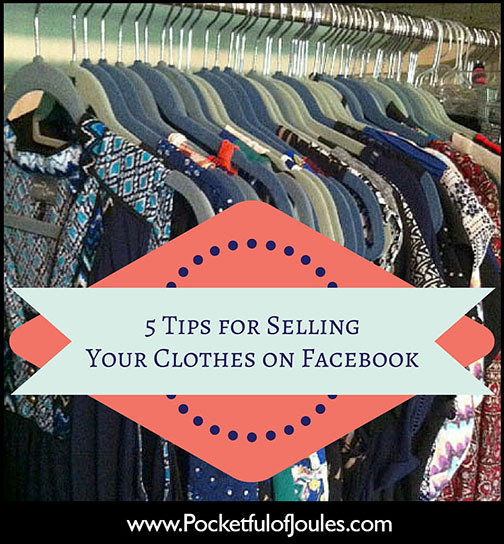 Have you bought or sold clothes off Facebook before? If so, do you have any tips to add? I think your point to take a picture of it on you is huge. If you are selling an XL top, I don’t want to see what it looks like on a Pinterest picture of a XS person. I want to see what it might look like on me- an XL person. I also think it is important to post a few key details of each item like washing instructions, fabric content and usually the length. My stuff sells faster when I include that right from the beginning. Awesome, thank you so much Adrienne. That’s a great idea to include washing instructions and fabric content! Love this! I’ve sold (and purchased!) all sorts of things off Facebook, but mostly in “garage sale” groups that are local to my town, where we meet in a public location and pay in cash. Checking out the Stitch Fix groups now! Oooooh and I’m off to check out some garage sale groups in my area! I’ve been selling clothes on Facebook for a year or two now. In fact, I haven’t tried selling them any other way yet (e.g. ebay or tradesy, etc). For some reason facebook feels safer to me. My favorite FB groups are “Effortless Anthropologie Trade Market on FB”, “J. Crew & Madewell Buy, Sell, and Trade”, “Free People Buy, Sell, Trade”, and “Boden USA Womens Buy. Sell, Trade Site.” I just joined the Anthropologie BST group, too. I love your StitchFix posts and I’ve almost considered trying it myself, but I know myself (I’m cheap/take forever to purchase) and that I’d almost never keep the items. But if I could sell the ones I didn’t love and get a deal on the ones I do because of it…that might work. I’m not even on Facebook, but I’d consider it for this. Thanks! Melissa recently posted…Worst Blogger Ever. aaaaaannndd Updates. I didn’t know there were groups where anyone could join! I’ve been a member of several local selling groups which are a complete NIGHTMARE when it comes to trying to sell something. Someone will say they are interested in your item, then you have to send them a message to figure out when you can meet & most of the time, they just won’t respond back to you! I definitely need to check out these other groups! Megan recently posted…mini beauty haul. Thank you for sharing this information. I really appreciate it! I’m a first timer in selling and buying clothes from facebook. I do have a question regarding about packaging. How much is it when it comes to shipping and handling? Any tips and advise? I usually just guesstimate, but you could certainly package up your item and weigh it at the post office for a better idea!